A neutral scarf is a must have addition to every winter wardrobe – it will go with any outfit and is not only instantly classy but this knit one will keep you nice and warm! Did you know that pink is super hot this season? I’m loving this bright clutch – check out this post from Nina for more ideas on how to incorporate this colour into your wardrobe. What are your favourite winter accessories? 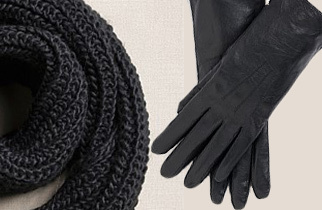 Those leather gloves are my pick! Get more plus size fashion and beauty inspiration from Meagan at her blog, This is Meagan Kerr.